This take on tacos (my favourite food) lets the avocados shine. This recipe offers a great opportunity to finish off your supply of Yves veggie ground leftover from the vegetarian shepherd’s pie. It also covers up the Yves flavour, if that’s not your favourite. Enjoy the health benefits of avocados and deliciousness in one meal! Creamy avocado tacos (photo credit: iStock). Cook the Yves veggie ground according to this recipe. (Very simply, you will place Yves and water in a pan and cook for a few minutes, adding taco seasoning if desired.) Then mix with this pick-me-up pico de gallo made of tomatoes and onions. Line the middle of the tortilla with the Greek yogurt. *Note: Greek yogurt is replacing sour cream. One full serving (175 g) of Greek yogurt contains 20 grams of protein, so it’s very healthy! Scoop the Yves veggie ground and pico de gallo mixture onto the Greek yogurt. Peel the avocado, place in a bowl and mash the avocado with a spoon or fork. You may choose to add lemon and garlic as in this guacamole recipe or keep it simple and leave as is. Scoop the avocado onto the Yves veggie ground, then add the salsa and lettuce. Fold the tortilla and eat immediately, or cut in half, store in a container and heat quickly at work. It makes a great packable lunch! Read more about the health benfits of avocados. Avocados are the belles of the fruit and vegetable ball. It took some time for them to hit their stride, but now everybody wants them. They’re beautiful, likeable and make you feel good. As their belle status implies, they’re also very popular; they get along well with salad dishes, Mexican meals and snack chips. 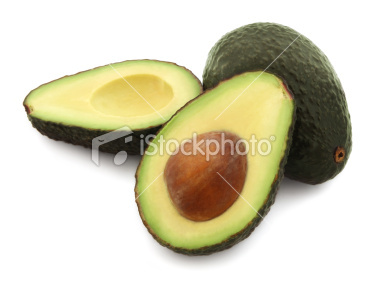 They’re also rich in monounsaturated fats and promote good skin. This week, I’m focusing on avocados. These delicious fruits only entered my life two years ago, but I wasted no time in finding ways to eat them. That’s why you can look forward to some avocado recipes coming later this week. They’re rich in healthy monounsaturated fats (the good fats), which help lower cholesterol and reduce fat (hello, flat belly…?). But don’t eat too many of them: they’re high in calories, so you’ve got to eat controlled portions, as with all foods. They offer 35% of your vitamin K quota and 30% of your daily recommended dose of fibre (thank you, Whole Foods). Avocados are heart-heatlhy thanks to their folate offering. This rich, creamy fruit increases the body’s ability to absorb carotenoids found in our favourite vegetables (add avocados to this delicious cucumber, tomato and olive oil salad). Finally, something that has potassium! This mineral helps your body maintain a healthy blood pressure. Avocados take some time to ripen and then they spoil quickly and easily. Buy 2 to 3 of them and check back here for more healthy recipes and ways to eat these delicious fruits before they go bad. Yum! Are you getting your body the proper nutrients it needs? Notice you need more vegetables than protein? For vegetarians, it’s very important we concentrate on what a non-meat diet is prone to lacking, which means protein, vitamin B12, and minerals like iron, niacine and zinc. My method: If you eat dinner with your family and have less control over the menu, find out early in the day what your meal will be, and plan a lunch and snacks that fulfill whichever needs are not met by your dinner. Helpful tip: If your dinner will be rich in protein and grain products, be sure to eat many servings of vegetables for lunch, with fruits for snack. Juice: Drink Tropicana or 100% real fruit juice. 120 mL = 1 portion of fruit juice, NOT a 450 mL Minute Maid bottle. This is something new you’ll be noticing on the blog. At the end of each recipe post, I will provide you with the daily food servings calculated for you. For eating healthy on a dialy basis, you may find it easier to keep track of your meals in a notebook. At the bottom of the page, tally up your daily food group intake.Good luck!